How has the Kewell A-League experiment gone? 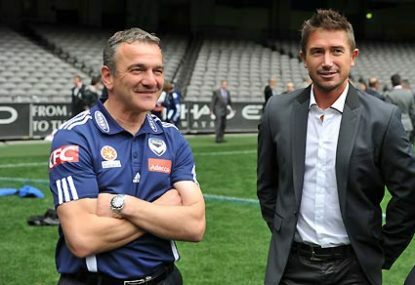 Harry Kewell’s debut season in the A-League will come to an early close this weekend. With the Victory out of the race for the A-League finals, Saturday’s game against Perth Glory will be the last chance fans have to see the 33-year-old until later this year. So how has, to rework the title of Grant Wahl’s book following the first days of David Beckham’s move to LA Galaxy, “the Kewell experiment” gone? The sheer scale of how bad this season has been for the Victory both on and off the pitch makes it hard to assess this question effectively. But while the club was imploding around him, Kewell often managed to inspire his team to some positive results. In his debut A-League campaign, we also saw the former Leeds starlet played in a range of positions and roles as first Mehmet Durakovic and then Jim Magilton tried to find the right formula for the Victory. It raises the question of how best to use Kewell. I spent the last week and a half in Russia following former Socceroos manager Guus Hiddink at his new club, Anzhi Mackhachkala. I bring this up because the way Hiddink is using Cameroonian super star Samuel Eto’o could well be instructive for the Victory. Before Hiddink took over, as Anzhi struggled to create opportunities against the many deep lying defences employed in the Russian Premier League, Eto’o would drop deep – often receiving the ball in his own half from Anzhi’s centrebacks – and try to create opportunities himself. While Hiddink’s early focus has been on securing the team’s defence (they’ve only conceded one goal in his three games in charge) Eto’o has been stopped from dropping deep and instead sticks right on the shoulder of the opposition centrebacks. Essentially, the Dutch tactician is looking to maximize his star striker’s effectiveness by putting him where he is most dangerous. Hiddink is on such big money in Russia because of this knack of looking at a squad and finding the key players and setting the team up to take advantage of this. So, is the best place to play Harry at the point of a defence, getting on the end of attacking moves and peeling wide to create or behind the striker? Or further back where he can arrive late into the box and instead allow Archie Thompson to play in his more favoured advanced position? These are questions the next permanent Victory coach – whether it be Magilton or otherwise – will have to find the answer to for the two-time A-League champions to succeed. These are difficult decisions to make and it’s why Victory must do their due diligence in appointing a permanent coach. In fact the whole A-League needs the Victory to get this decision right and it’s not just because the Victory are the league’s biggest club (though that’s a fair point). The Central Coast Mariners and Brisbane Roar have dominated for two seasons now, but their football has failed to significantly progress in this campaign as was highlighted in the opening stages of the ACL. When these teams came up against more organized defences than we see in the A-League, they struggled to break them down. While both clubs will hopefully learn from their Asian experience, they need the rest of the competition to significantly improve to push them to keep developing – something which didn’t happen this season. The Roar and the Mariners have taken the first step in the development of Australian club football, now their A-League rivals must push them the rest of the way starting with Melbourne Victory.